What are the intended purposes of the rifle? What are the intended ranges you plan to shoot? What ammo do you plan to shoot the most? Sometimes more info is needed, but the above will typically give us enough information to start recommending some options. In the past, we’ve used various barrels from a variety of manufacturers, including Lothar Walther, Ballistic Advantage, LaRue Tactical, Rock River Arms, White Oak Armament, Green Mountain, and so on. However, one name that was somewhat unfamiliar to us, yet popping up all over the interwebs, was Faxon Firearms. After watching their popularity build over about a year or so, I reached out to their rep Nathan, and started a conversation about getting in one of their barrels to test. What really drew me to Faxon, on top of all the internet hype, was the fact that Nathan, their rep that posts on ARFCOM (and I’m sure various other forums), was willing to share a great deal of information with the community, offering up a wealth of knowledge on subjects covering the barrel making processes, the different types of barrel lining / finish options, etc. Next, was the pricing on their barrels. We know all too well how expensive it can be to build up an AR for hunting. While we are currently enjoying a nice dip in the market, as far as pricing is concerned, we’ve been around long enough to have seen three panics in the last 8 years. We also know what it’s like to have to build on a budget, and that’s where Faxon comes into play. After some back and forth with Nathan, I was having a hard time choosing between two of their barrel offerings: an 18″ GUNNER series 4150 QPQ barrel, or an 18″ Heavy Fluted 416-R Stainless Steel QPQ barrel. 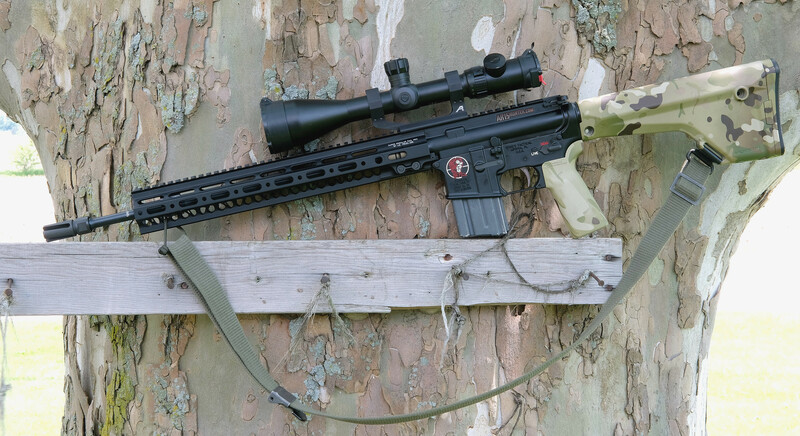 Both were very affordable, with the 416-R SS barrel being the more expensive option. In the end, I picked the GUNNER series barrel. I did this for a few reasons, but mainly because it was very affordable (retail is about $189), and it offers a pencil profile; making it MUCH lighter than the heavy fluted. Being that Faxon Firearms is also in Ohio, I was also happy to be supporting another “local” company. After placing my order with Faxon, it was two days and my package was delivered. It helps only being about 3.5 hours away. When I opened the package, I was blown away at how light the barrel was. 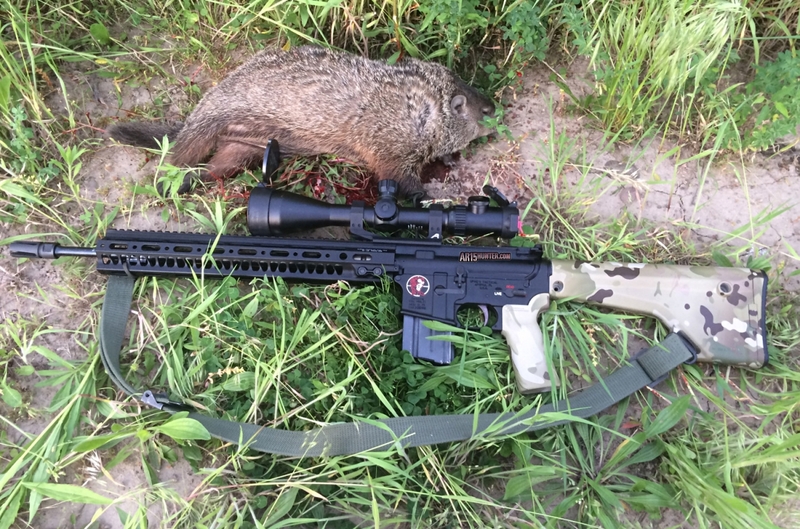 Faxon notes that this barrel weighs about 23 ounces (1.44LBS is the actual spec on their site), making it about 3/4 of a pound lighter than their 18″ heavy fluted SS barrel, and probably 2+ pounds lighter than the barrel I currently use on my main hunting rig (a 20″ Lothar Walther Varmint Tactical barrel). Along with the barrel, I ordered one of Faxon’s .625″ Ultra low-profile, lightweight gas blocks. It weighs barely 1 ounce! It’s by far the lightest gas block I’ve ever held. Combined with the barrel, we were at just 25 ounces or so for the combined weight of the barrel and gas block combo. That’s very light for an 18″ barrel. So, what was the total retail price on the barrel and gas block combo you ask? Surprisingly, only $218.99, before shipping. Talk about affordable! While I was happy about the price, I was still a little leery on how well this barrel would perform. Being it was designed more for 3-Gun type shooting, I was curious to see how well it would shoot for me with my favorite varmint ammo. Manufactured 100% in-house, in the great state of Ohio! Here you can see the entire profile of the GUNNER barrel, from the barrel nut forward. A close-up of Faxon’s .625″ Ultra l0w-profile, lightweight gas block. This block weighs just a hair over 1 ounce. It also shares a similar QPQ finish. The thinnest portion of the barrel is forward of the gas block. Here the barrel measures just .500″ on our calipers, and it makes our Smith Vortex flash hider look huge! This is also where Faxon marks the barrel. Ours says, “5.56 NATO 1-8”. Lastly, here is a side-by-side of the 18″ Faxon GUNNER barrel next to an 18″ Green Mountain barrel, which has a medium/heavy contour. The Faxon barrel measures approx. .679″ right after our Geissele barrel nut, tapering down to .615″ just before the gas block journal. As noted above, the thinnest point we measured was .500″. The Green mountain barrel measures approx. .840″ forward of the Geissele barrel nut, tapering down to .755″. Its thinnest point is .720″. It’s important to also note that this particular Faxon barrel uses a .625″ gas block, where as the Green Mountain above uses a .750″ block. As for weight. The Faxon GUNNER weighs approx. 24 ounces stripped, compared to the Green Mountain at 37.5 ounces. The day the barrel and gas block combo arrived, I was ready to build the upper. I already had all the other parts needed on hand, which consisted of a Colt M4 upper receiver, a Colt M16 BCG, a Geissele 15″ SMR MK2 Rail system, and a Smith Vortex flash hider. 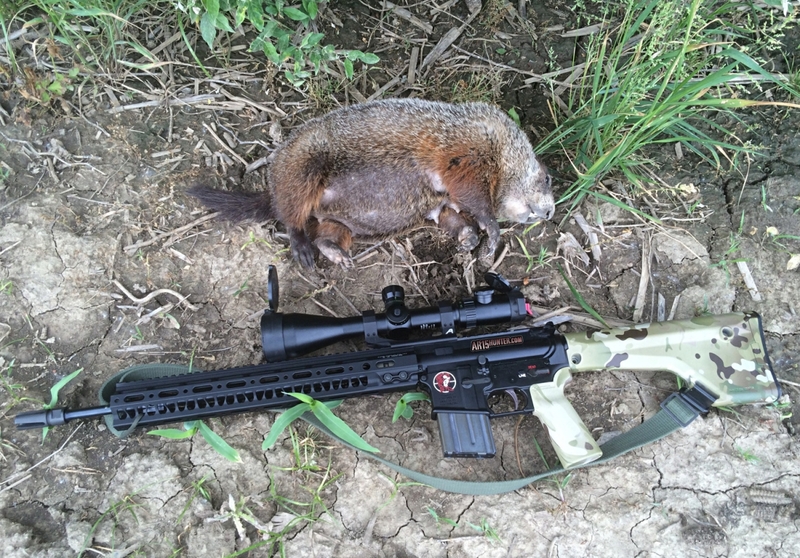 In a short time, I had the upper built, and I proceeded to install my Bushnell Elite Tactical 6-24x50mm FFP scope mounted in an Aero Precision Ultralight scope mount. My only complaint about the barrel at this point was that Faxon does not dimple the barrel for easier gas block alignment. This is a small annoyance, but it’s worth nothing. Thankfully, the weather was quite nice that day, so I raced to my local gun range to get an initial 50 yard zero. 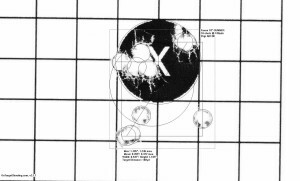 After I walked in the zero with just three single shots, I setup to shoot a 10-shot group at 50 yards to confirm that the rifle was zeroed properly with my ADI .223 55gr BlitzKing ammo. 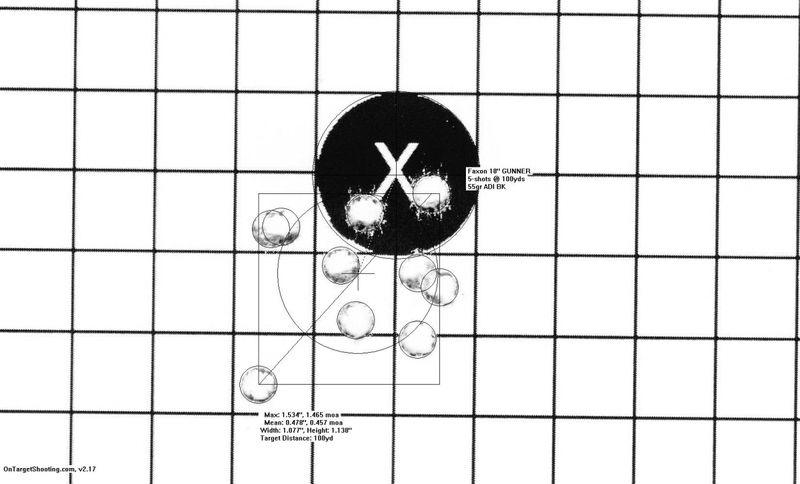 It’s always a good idea to use a 10-shot group to confirm your zero, as 3-shot groups may not give you the true center of your POI (Point Of Impact). 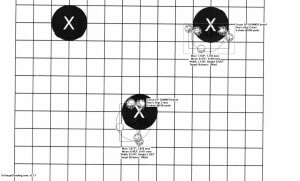 At the minimum, try and shoot a 5-shot group. When I looked through the scope, I was very excited to see the group I had just shot, which was pretty much one big ragged hole (see the image below). Mind you, this was with zero “barrel break-in”, and only 15 0r so rounds fired through the barrel. The ES of the group was just 0.943MOA, or 0.494″. Needless to say, I was impressed with how well this pencil barrel was shooting, even at just 50 yards. The barrel itself is very well made. Being this is what I’d consider a “budget” barrel, the finish may not be as smooth as much more expensive barrels, but you can tell this barrel was machined well. Faxon has almost 40 years of experience in precision machining, and it shows when you look at their barrels; especially their Flame Flutted models. As mentioned earlier, and in our YouTube video, Faxon applies a QPQ, or Salt Bath Nitride finish to both the exterior and interior of their barrels. 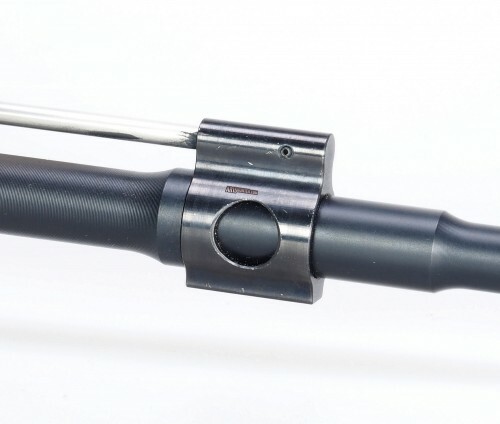 QPQ is becoming more and more popular with AR barrels, offering some accuracy and corrosion resistant benefits over the more traditional finishes used on both steel and stainless steel barrels. While not as heat resistant, as say the chrome-lining found in many “mil-spec” barrels, QPQ offers plenty of resistance for the average shooter and hunter. The added corrosion resistance is very appealing to me as a hunter, as I find myself in wet conditions often (especially in the colder months), where the fact that the barrel is protected inside and out will help reduce the possibility of my barrel rusting if I fail to get it dried off completely. 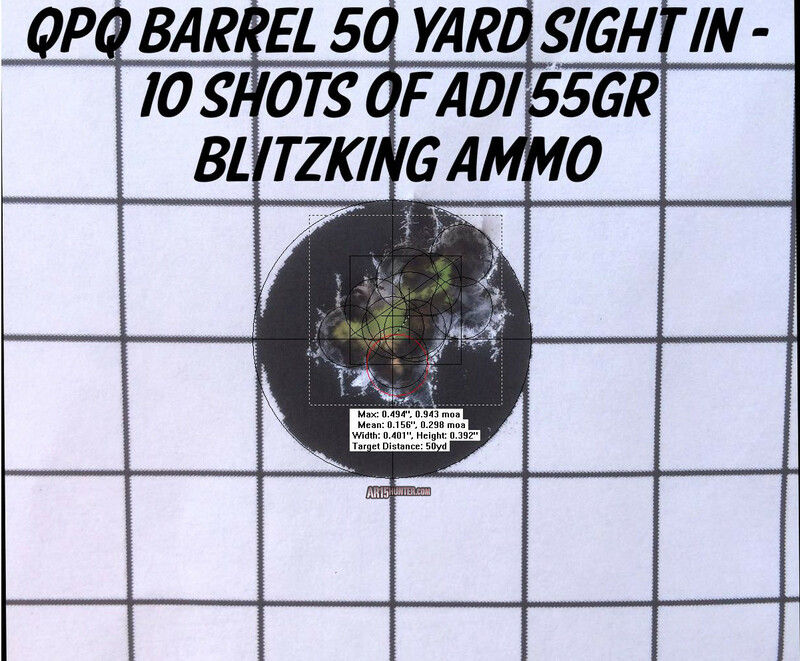 As for accuracy, many folks contend that QPQ barrels offer greater accuracy potential over chrome-lined barrels. This is because QPQ is a surface treatment, versus a lining. Therefore, QPQ barrels can offer better, or possibly tighter tolerances. Nitride is also harder than chrome, and more corrosion resistant (as mentioned above). Lastly, the QPQ process is much less expensive than chrome lining. That said, I’m not going to sit here and say that QPQ barrels are more accurate than chrome-lined barrels. It’s not a blanket statement I can make. More important than the treatment, coating, or lining, is the quality of the bore when the barrel was manufactured. The weather in Ohio was still crap. Spring was coming and going, and the rain wouldn’t quit. Therefore, I didn’t have much luck getting out to hunt shortly after I got the GUNNER barrel. Thankfully, we got a decent day and I headed out to one of the local farms I have permission to hunt on. This particular farm was quite bountiful last season, with lots of whistle pigs. One of the fields has some problem spots, where the groundhogs have holes right in the middle of the field. Whenever the farmer is in the field with equipment, these holes cause issues with their equipment; not to mention one rough ride. As I crossed the adjacent field, I saw a whistle pig! Unfortunately, he saw me as well! After he ran back to his hole, I got into position and waited. Sure enough, about 20 minutes later he came back out. He was very leery on exiting his hole, poking his head out here and there, then going back in. Finally, after another 7-8 minutes, he came out and stretched his legs. That was his mistake, as I slowly brought up my rifle, and lined him up in my corsshairs. 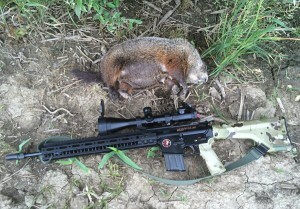 With a slight squeeze on my LaRue MBT trigger, the rifle reported and I watched as the 55gr BlitzKing smacked him. It was DRT (Dead Right There), and below is how I found the pig when I walked out to confirm the kill. The shot was a short one, at 69 yards according to my Nikon laser rangefinder. Still, I was again very happy with the performance of the Faxon GUNNER barrel. 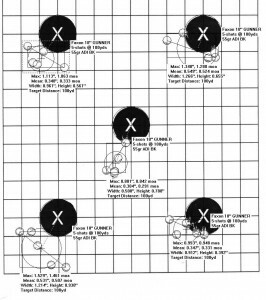 Due to weather, it was a week or so before I could get to the range to get some “accuracy” testing at 100 yards; more on that below. Over the course of the next few weeks, I was able to take two more ground hogs with the Faxon. In each instance, the barrel performed very well, giving me one shot, one kill results. Unfortunately, I was not able to take many long shots with the GUNNER barrel. The longest kill was about 95 yards. At some point I hope to get a chance for a longer, 200+ yard shot with this barrel. Below are some photos of the additional kills (please excuse the quality of these next photos, as I had to use my iPhone to capture them versus my camera). 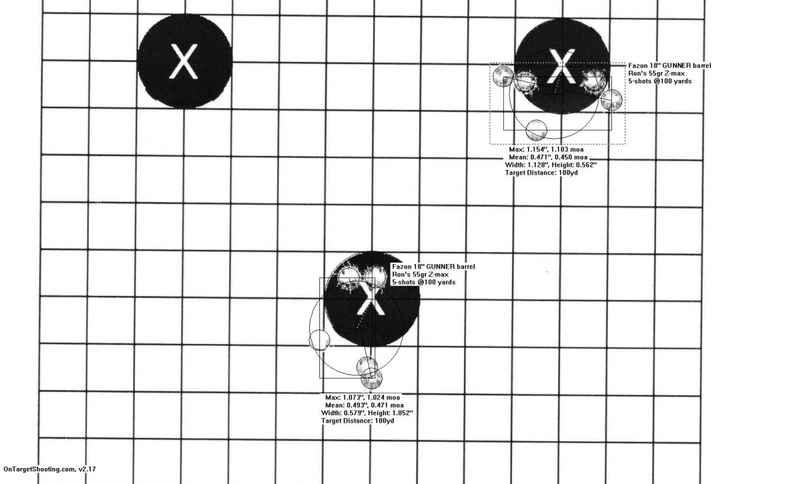 Per our usual procedure, I took the Faxon GUNNER equipped upper to the range to see how well it would shoot at 100 yards. I rested the rifle in my Target Shooting Inc rest, then setup up a target at 100 yards. I then proceeded to shoot five, 5-shot groups with the same ADI ammo used above. The results were well above my expectations, as the little pencil barrel continued to impress me. 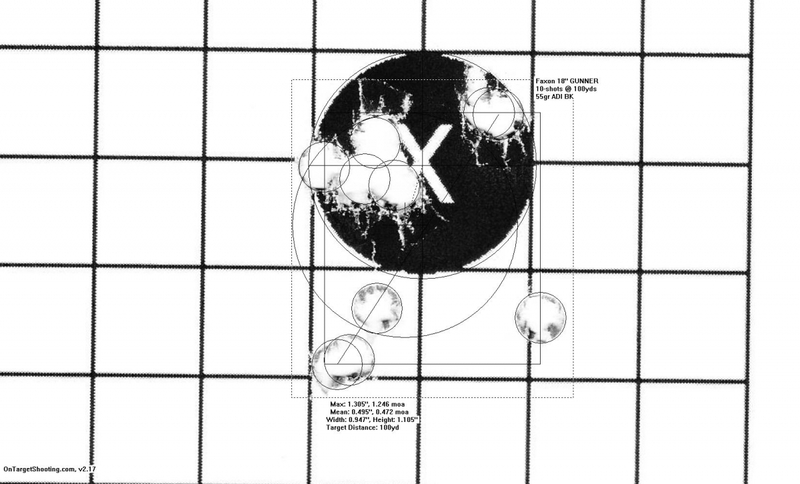 The average of the 25 shots was 1.19MOA, with the smallest 5-shot group measuring .842MOA. These were not cherry-picked groups either, rather 5 consecutive groups. 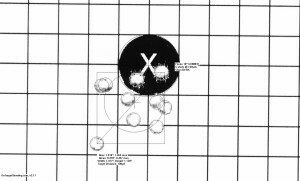 I then shot two more 5-shot groups with some hand loads that use Hornady 55gr Z-max bullets; which is a proven load from an old timer I sometimes shoot with. They both hovered right around 1MOA. 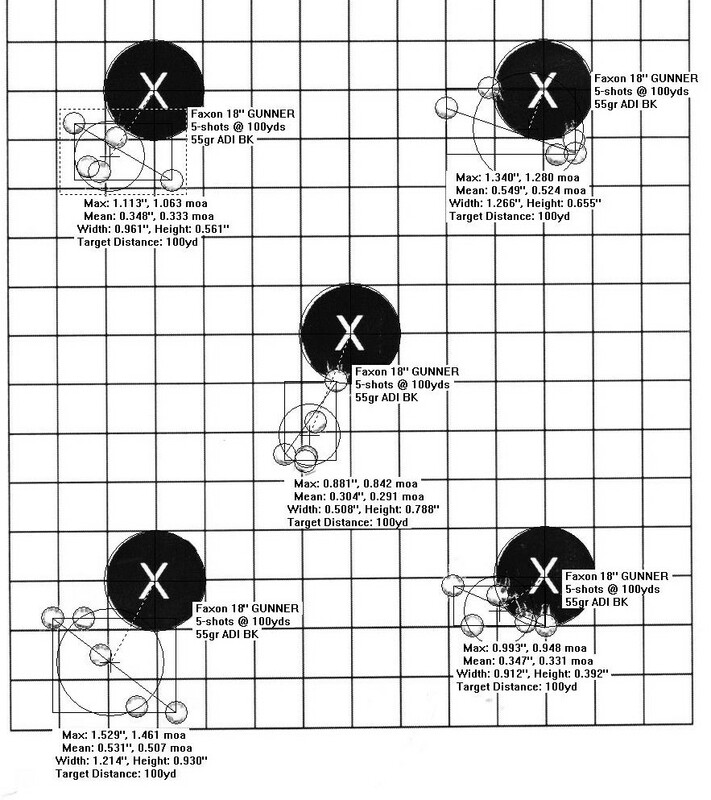 Finally, I shot two 10-shot groups with the ADI ammo. I wanted to see how well the barrel performed once it was heated up a bit, and the results were again impressive. The ES (Extreme Spread) of the first 10-shot group was 1.25 MOA, with the second opening up slightly more to 1.46MOA. This was with no “cooling off” period, other than the time it took me to police brass and load up another 10 rounds in my mag. To say this barrel shoots well is an understatement in my opinion. This isn’t a 416-R stainless barrel. This is a standard 4150, button rifled barrel with a QPQ finish inside and out. Below you can see each of the aforementioned groups. When I started thinking about this review, I was hoping to find a quality “budget” barrel, that would still work well for small to mid sized game. Faxon’s GUNNER barrel exceeded all of my expectations, shooting much better than I anticipated. Don’t get me wrong, I didn’t expect it to shoot poorly. But, I didn’t envision it would be able to shoot several sub MOA 5-shot groups at 100 yards, let alone sub 1.5MOA 10-shot groups. Their Hybrid Pencil profile works great, offering the needed material from the extension to the gas block with its government like profile, finished off with a pencil profile to help reduce weight, and give a more well-balanced feel. 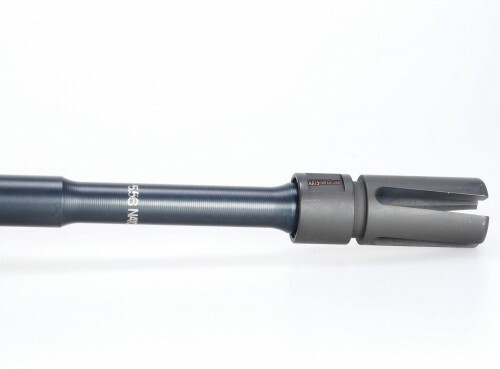 With a retail price of only $189, Faxon’s 18″ GUNNER barrel offers an outstanding value. 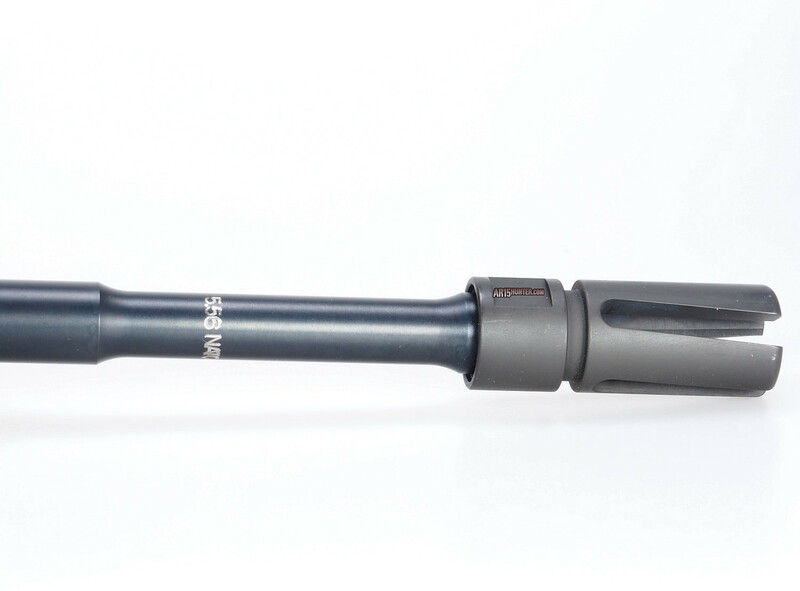 Whether you’re looking for an affordable barrel for your hunting rig, or a dual purpose barrel that will work well for range time or 3-Gun events, as well as knocking down critters; the GUNNER is sure to please. You can get yours today from Brownell’s using the this link. Note, this is an affiliate link that AR15 Hunter benefits from. 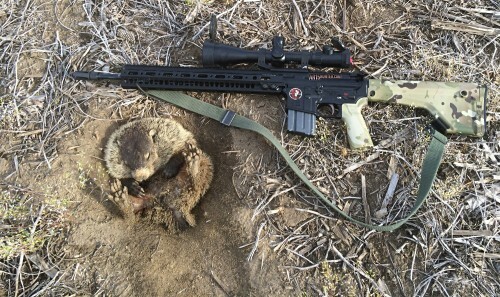 By purchasing products from our affiliates, you help keep the lights on here at AR15Hunter.com, as well as help pay for ammo and other equipment we use in our hunt reports and reviews. We are not sponsored, so we thank you for YOUR support!